The Parish of Shaugh Prior lies about 8 miles north-east of Plymouth, on the southwest slopes of Dartmoor. There are no major roads through the Parish, and only two through routes; running northwest to southeast the road from Bickleigh to Cornwood and Ivybridge passes through the three major settlements of Shaugh Prior, Wotter and Lee Moor, and the road from Plympton to Yelverton and Meavy passes north-south through the Parish. 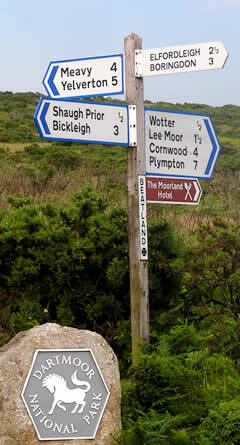 Much of the north of the Parish is open moorland, crossed by streams between Dartmoor tors. In former times this area was the scene of mining and quarrying - now it offers outdoor activities and sheep, cattle and Dartmoor pony grazing. The central part of the Parish is dominated by the China Clay pits above Lee Moor and Wotter villages, and the China Clay works in the valleys below. The barren white landscape of spoil heaps and huge excavations dwarfs the massive machinery used to extract the China Clay. To the south, a belt of farming and woodland isolates the Parish from the commercial encroachment of Plymouth.